Lisa Ling of "The View" addressed a crowd as the keynote speaker of the Asian American Journalists Convention yesterday. There's a certain electric frisson to an Asian American Journalists Association convention that comes from employment empowerment -- it's more than a career-workshop, job-fair, networking frenzy -- and it's true you won't see many blond heads there. But neither will you see many gray hairs. It's a young person's game, and many a nascent career can be jump-started at such an event. 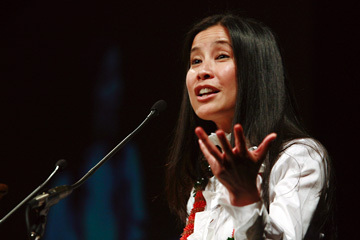 The "J," however, stands for journalism, and Lisa Ling's keynote speech yesterday brought conventioneers back to the reality of the profession. It's about communicating the realities of the world we live in. Ling, herself the beneficiary of a charmed career path -- plucked out of a Sacramento high school to star in a nationally syndicated teen magazine show, at 18 the youngest reporter for Channel One News, a regular on Barbara Walters' "The View" right out of college, and she's not even 30 -- was hit by a hard dose of reality soon after going to work for Channel One. "I was one of those youngish, cutish, stylish anchor people hired for the show, and one day I was asked to go to Afghanistan," she said. "A complete culture shock. I was surrounded by boys with weapons and an utter look of lifelessness. No one knew how old they were, and they could have shot me right there. No one cared. I wondered, 'What will happen to these boys in 10 years?'" They became the Taliban, continued Ling, and Afghanistan was torn apart from within. The experience became a professional touchstone for her: "I wondered why the world wasn't talking about what I was seeing. I came back filled with culture shock; it began my desire to tell these stories, even tragic and vital stories. "The mainstream media pretty much ignores the rest of the world unless there's catastrophe or war, and I find that reprehensible. Young people do want to know what's going on elsewhere, but there are fewer opportunities for journalists to go out into the real world and report what they find. The (cable news) networks instead put on old white guys who sit and yell at you what to think." Because news outlets these days are "celebrity and pop-culture oriented," Ling said it's the responsibility of working journalists to "go out there and push it -- we're obligated as journalists to find these stories ourselves." These feelings grew for Ling after the Sept. 11, 2001, attacks, and she left "View" to talk herself into a globe-trotting position with National Geographic television. A piece on Indian children incarcerated in prison with their mothers -- "There's an interesting duality to every story, and I went there thinking it was horrific, a very Westernized attitude, and it turned out different than I thought" -- was featured on the Oprah Winfrey show, which led to an ongoing gig doing such pieces for Oprah. "Oprah is the real deal, truly committed to changing humanity, truly truly passionate about these stories. She says, 'Journalists, now that you know, you can't pretend that you don't.'" Speaking of knowing, Ling is just back from a couple of weeks in North Korea, an "unnerving, disturbing feeling of having no access to the outside world," she said. "I had no idea if any big news had happened. I was allowed one phone call, so of course I called my mom. I got through, and Mom says, 'Did you hear about Meredith Viera replacing Katie on the "Today" show?'"